And by new, we mean new — this wine is released 5 to 8 weeks after harvest. In the wine world, it doesn’t get any newer than that. So, what exactly is Beaujolais Nouveau? And why is it so great for Thanksgiving? Beaujolais (the place) is a province in France that is north of Lyon (which is just under 300 miles south-southeast of Paris). The province gives its name to the most famous wine grown in its environs. 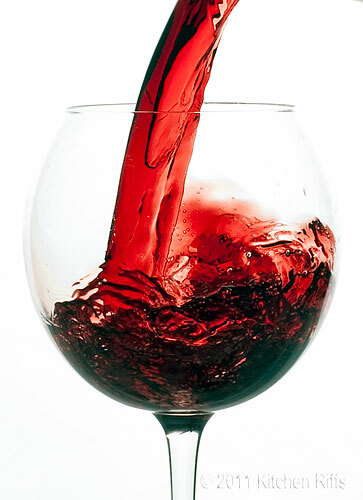 Beaujolais (the wine) is a low tannin, (usually) red wine that is almost always made from the Gamay grape (the white is made from Chardonnay). It’s a light, fruity, easy-to-drink wine that usually is consumed within 5 years of its release. The Nouveau (new) variety is released just a few weeks after the grapes are picked; regular Beaujolais is released a year after harvest. The regular Beaujolais often is sold simply as “Beaujolais.” A step up in quality is “Beaujolais-Villages.” Another step up (sometimes many steps) would be the “cru” wines. Cru is a French word that in this context means something like “growth” — and typically is used to designate a superior wine. A cru wine always comes from a specific place. In the case of Beaujolais, that place is one of 10 villages: Brouilly, Chénas, Chiroubles, Côte de Brouilly, Fleurie, Juliénas, Morgon, Moulin-à-Vent, Régnié, and Saint-Amour. There are several producers of Beaujolais whose wines you’re likely to find in a good shop: George Duboeuf, Louis Jadot, Barton & Guestier, Louis Latour, and Olivier Ravier. Of these, Duboeuf’s Beaujolais is the most widely distributed in the US. It is almost always a good wine and usually a good value. But in truth, any Beaujolais is almost always a good wine and a good value — and can be enjoyed either on its own or with a meal. Although it lacks the complexity and depth of an aged Burgundy or Pinot Noir, it also sells for a fraction of the price. And it’s a wine that doesn’t get in the way of the food you’re eating, which tends to be a good thing. Nouveau means “new” in French, and wine with that designation (also called vin de primeur) comes to market almost immediately after the grapes are picked and pressed into wine. 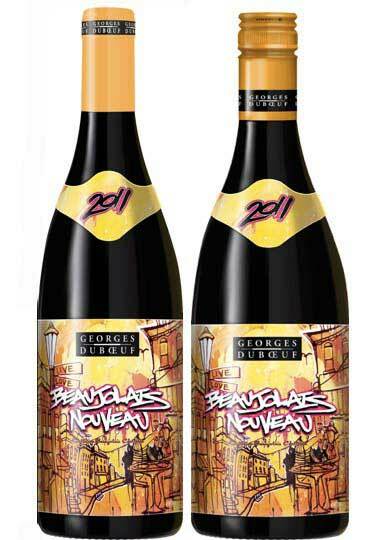 Beaujolais Nouveau is the most famous of the nouveaux (in fact, when you ask for just “Nouveau,” it’s understood to mean Beaujolais Nouveau). In the case of Beaujolais Nouveau, the wine has a fresh, playful, exuberant taste, but lacks the depth and dimension gained by aging the wine or exposing it to the wood of a wine cask. Nouveau doesn’t have as much heft as regular Beaujolais. It also can vary in quality from year to year. Of course, regular Beaujolais can vary too. But with aged wine, makers can better control the process in order to achieve the flavor profile and quality level that is the particular winemaker’s signature. Beaujolais Nouveau is essentially raw wine with minimal winemaking skills applied to it, so you’re not always sure what you’re going to get. In the past, there have been some clunkers. Nowadays, almost every Nouveau is quite drinkable, although not always memorable. But then, it’s not supposed to be memorable. It’s more a celebration of wine – and over the years the celebration has become a huge marketing opportunity for winemakers. Some people think Beaujolais Nouveau suffers from all the marketing hype, and they may have a point. Certainly, no other wine enjoys the kind of hoopla that accompanies the release of each year’s Nouveau. Still, it’s a fun tradition and a great wine, so maybe putting up with some hype is worth it. Which Beaujolais Nouveau To Choose? Wine shops seem to be importing fewer labels of Beaujolais Nouveau than they did in the past. If you’re faced with a selection, however, and don’t know which to choose, I suggest buying the George Duboeuf label. Duboeuf is practically synonymous with Beaujolais (the same way Campbell’s is synonymous with soup), and Duboeuf always produces a decent Nouveau. It’s usually priced between $9 to $11. You might also want to look for whatever Nouveau Kermit Lynch (a wine importer and distributor) is offering this year. (The wine distributor’s name is always on the label, sometimes just on the back label). I’ve found the wines that Lynch selects to be good. Why Beaujolais Nouveau for Thanksgiving? Thanksgiving dinner poses a challenge when it comes to matching wine with food. Turkey has both light and dark meat. So do you serve a white wine for the light meat? Or a red wine for the dark? The meal also typically features savory and spicy (stuffing) and sweet (cranberry sauce and candied sweet potatoes) dishes. It’s difficult to find a wine that handles such a wide gamut of flavors. To compound the difficulty, you may have people at the table who only drink wine at festive occasions, and thus may prefer a lighter, fruitier wine rather than one with lots of tannin, like a fine cabernet sauvignon. For my money, however, Beaujolais Nouveau is really the only wine to serve. Why? Because it is perfect for Thanksgiving! For one thing, it’s released exactly a week before the holiday. You can’t ask for better timing! More importantly, it has a fruity (but not sweet) and robust flavor that handles the range of tastes on the Thanksgiving table with aplomb. It’s delicious with both light and dark turkey meat. Dressing? Ditto. Cranberries? Goes great. You get the picture. It’s even good with pumpkin or pecan pie. Best of all, it’s a wine that even people who don’t much like wine tend to enjoy. OK, you already know this part: Open the wine and pour it into glasses! 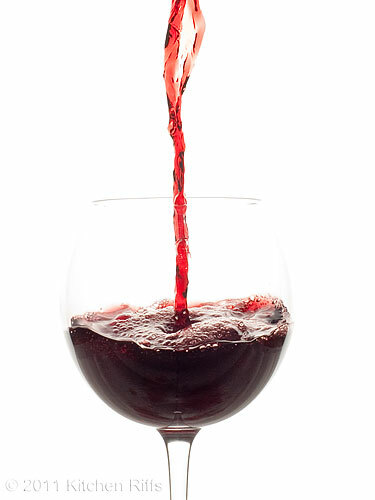 Depending on how big your glasses are and how generously you pour, you’ll get between 4 to 6 servings of wine per bottle. What you might not have considered is chilling the wine first. Generally, we drink red wines at “room temperature” (though when that rule was formulated, rooms generally were cooler than today’s centrally heated houses). But Beaujolais in general, and Nouveau in particular, benefits from a brief stay in the refrigerator before serving. Refrigerate for 45 minutes or so. Around 55 degrees Fahrenheit is ideal. But don’t worry if you get it a bit too cold; it’ll warm up in a hurry when you pour it into glasses. Beaujolais Nouveau is meant to be consumed when it is extremely young — as in, immediately upon purchase. Tradition has it that you should finish your Nouveau by New Year’s Day. It’s not that the wine will turn to vinegar on January 2nd. It will still be perfectly good to drink. But this wine isn’t made for aging, so by early spring it will begin to lose its vibrancy and fresh personality. For years now, Mrs. Kitchen Riffs and I have always bought a supply of Beaujolais Nouveau within a day or two of the third Thursday in November (the 17th this year). Of course, we share a bottle almost immediately just to see what the year’s Nouveau tastes like. And because we favor turkey for both Thanksgiving and Christmas, it’s always the wine we serve at our house for those meals. But we usually still have some left over in the last week of December. And believing that you can’t be too careful, we always make sure to finish our Nouveau before the end of the year. Because hey, you never know, right? We get this every year when it comes out. In fact, my mom is bringing us some this Thanksgiving (all the way from Michigan!). Hi Every Little Thing! It's a delicious wine, isn't it? I'll be out buying some tomorrow when it's officially released. Thanks for the comment. I don't drink wine but I just love your photo shot. Love the first one. Great job! Hi beyondkimchee, thanks for the compliment! I had a lot of fun taking these pictures. It was messy though - a couple of times the wine sloshed onto the table under the glass (fortunately I had plastic and paper towels to catch the overflow). thanks for stopping by. It's that time of year! Thank you for this educational post! I love your description of Beaujolais Nouveau not being memorable, but it being a celebration of wine, I totally agree. Your tips on which ones to buy are really helpful, I never know! In Israel they are celebrating the releases of their "Beaujolais Nouveau"-styles wines right now, which almost certainly run the gamut in terms of taste and quality. But Israeli wines are almost all best drunk within a few years anyway. I would love to see a photography post from you on how you get these incredible drink shots! I find drinks to be the most difficult and you capture them just perfectly. Both this kind of dramatic action pouring shot, and the way you set a scene with cocktails. I have trouble with both. Whoops! In replying to PhyllisJanes' comment I accidentally deleted it! Anyone know how to restore comments on Blogger? Anyway, she asked how I took the pictures without them being blurred, and guessed fast shutter speed. It's actually flash duration that takes the picture. If you have a flash with a short enough duration - about 1/1000's second or less - it stops motion. 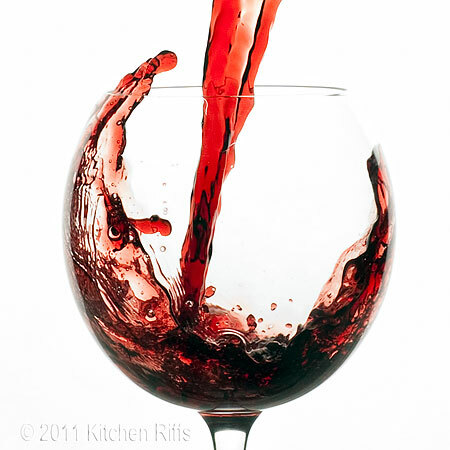 The wine glass is backlit by a softbox, and it's the flash that stops the motion and illuminates the picture. My apologies for deleting your post - I just accidentally hit the wrong button on my control panel. Never knew it was so sensitive! But thanks for commenting. @Katherine, Thanks! I've actually being thinking about adding some non-recipe content on the blog, and food photography is something I've been thinking about. The biggest problem with drink photography is handling reflection in the glasses (the glass reflects 180 degrees so you have a lot to think about with that; and in glasses with liquids, the liquid acts as a "lens" so the area of reflection is more than 180 degrees! The book Light, Science, and Magic is a great starting point for how to handle light in photography. A new edition is out, or just about to be released. Thanks for stopping by. Your wine photos are stunning! Thanks for sharing the background on beaujolais nouveau with your readers. Hi Beth, thank you for your kind words! And thanks for stopping by. You are soooo smart. It is a great choice for Thanksgiving. I do like Beaujolais Nouveau and never really knew much about it. But I always got Villages so I guess I was doing something right. Thanks for the education but I have to say that the photo stuff is over my head, though I very much appreciate what you do. Awesome. Lighting is so hard. Maybe you could give tips for a Nikon Cool Pix. Hi Abbe, isn't Beaujolais nice wine? I like the Villages a lot for a nice drinking wine. Agree lighting is hard! With a Nikon Cool Pix I'd concentrate on first learning natural light - a nice big window with soft light. If you need softer lighter, you can diffuse it with tracing paper. Add a piece of white cardboard to bounce light into the shadow side to help even out the light. There's a fairly good website on food photography you might find helpful: http://www.learnfoodphotography.com/ Thanks for commenting! Fantastic post. Such a great choice for this time of year. Hi Tori, thanks! I agree, Beaujolais Nouveau comes at the perfect time of the year, both for its match with food and because it reflects the general celebratory period we're entering. Thanks for your comment. Wow, I love your wine photos. Amazing. I need to learn how to do that. And now I need to go buy a few bottles of Beaujolais for Thanksgiving dinner! Hi zenchef! Thanks for the compliment - that's high praise coming from you. Your photos are absolutely gorgeous. Thanks for taking time to comment. Oh I love Beaujolais so Beaujolais Nouveau sounds right up my alley! Hi Gourmet Chick, Beaujolais is a wonderful wine. So if you like that, you definitely owe it to yourself to try the Nouveau. Thanks for commenting.